Magnetic wear liners ideal for boltless applications. MagLiners are high-performance magnetic liners that can be installed simply and quickly in particular applications where bolting or weldable wear liners are not feasible. 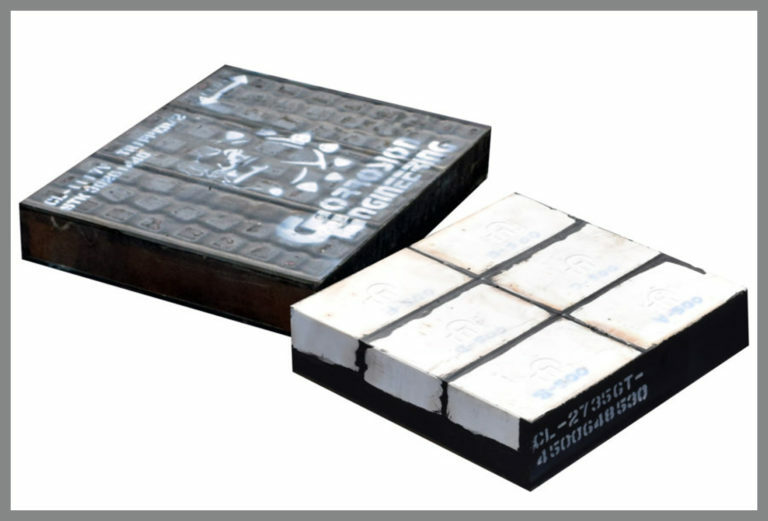 Magnetic ceramic wear liners, MagCube and MagTile, offer all the performance and protection features of CorroTile and CorroCube liners in a package secured to the chute with high strength magnets. This eliminates the need to affix an attachment system to the inside of the e or drill holes in the equipment. The magnets are vulcanize-bonded into the rubber and backing plate and will not come loose. MagLiners are the natural choice when liner changes must be made rapidly, access to the lined area is difficult, and when other attachment systems cannot be installed. The rectangular high strength magnets are carefully positioned in cut-outs in the backing plate so that the surface of the magnet is coincident with the back of the liner. No magnetic attachment force is lost due to a gap between the magnet and the chute. In extreme wear applications where traditional fastening methods are inapplicable, MagCube and MagTile’s magnetic composition allows for easier installation without the need to affix an attachment system or drill holes in equipment. This benefit minimizes labor and increases safety of installation. Engineered with exclusive forming and firing technologies, our superior alumina ceramics offer exceptional wear, abrasion, and chemical corrosion resistance and have the ability to outperform alternative wear materials, such as wear-resistant steel, by as much as 10 to 30 times.